We had a very busy weekend planned with us looking after a total of seven cars in two categories much like the previous round at Townsville. 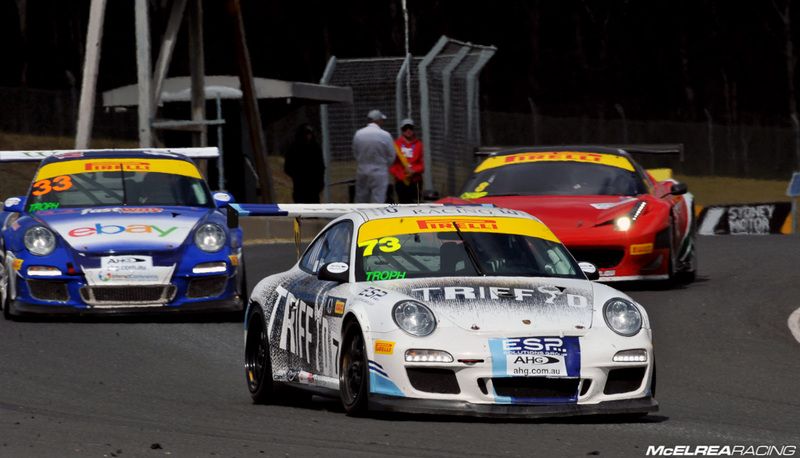 The usual Carrera Cup cars of Luff, Davies, Walls and Gracie were joined by Scott Taylor who was having his début after graduating from the GT3 Cup Challenge series. In the Australian GT Championship (AGT) we were once again looking after Michael Hovey and the always improving Simon Ellingham. We had tested at Sydney Motorsport Park (formerly known as Eastern Creek) back in June, and were quietly confident of a good result for all of our MR drivers. Luffy qualified on pole with a stunning lap time over 6 tenths of a second clear of Patrizi in 2nd. He was justifiably confident heading into the weekend but missed the optimum wet-weather setup and both Luffy and Shae didn’t get the result we felt they deserved in the wet opening race. Luffy stayed focused and did a great job to bounce back to 3rd in race 2 and 2nd in the final race, just behind a resurgent Craig Baird. He went into Eastern Creek equal with Steve Richards for first place in the Pro and Outright Championship standings and left 12 points adrift of Richo and only 44 points ahead of multiple champion Baird. Luffy and the team are now looking forward to Sandown and regaining the Championship lead..!! Shae qualified 6th but (to put into perspective how close the qualifying times were) had his time been 3 tenths quicker he would have been on the front row beside team mate Luffy. He was unhappy with the grip of his car in qualifying or the first two races but Shae and his crew worked hard all weekend continually fine tuning the setup to finish 4th in race 3 with a best lap time of only 2 tenths off the race winner. Once again Shae has proven that he is one of the top up-and-coming drivers in Australia and the only guy to consistently challenge established stars Luffy, Richards and Baird in such a closely fought Championship. Shae continues to prove that he is a serious Championship contender and drove the wheels of Scarletta in the wet opening race..!! 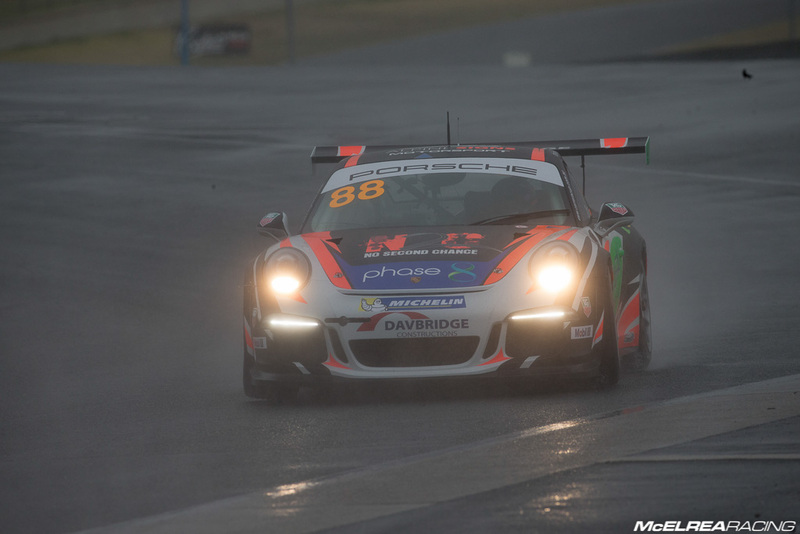 ‘Princess’ had a new personal best result of 9th outright in the torrential rain in race 1 after she qualified 17th (11th in Pro) in the 23 car field. Renee’s aggression in race 1 was outstanding and by far her most impressive racing performance since stepping out of a kart less than two years ago. Her pass on Elite Championship leader Steve Grove into turn 1 in the rain at close to 200 kmh was a highlight. Unfortunately she was the victim of her own ambition in race 2 and got caught-out passing a slower Ash Samadi into turn 1 resulting in a spin. Race 3 ended early after being hit by another Elite driver on the first lap bending her steering forcing a slow race to nurse the car to the finish. Gracie drove brilliantly in the wet conditions passing a total of six cars in the first race..!! ‘Wallsy’ qualified brilliantly to finish 14th outright and 4th in Elite class only 4 hundredths of a second behind former team mate Tony Bates. 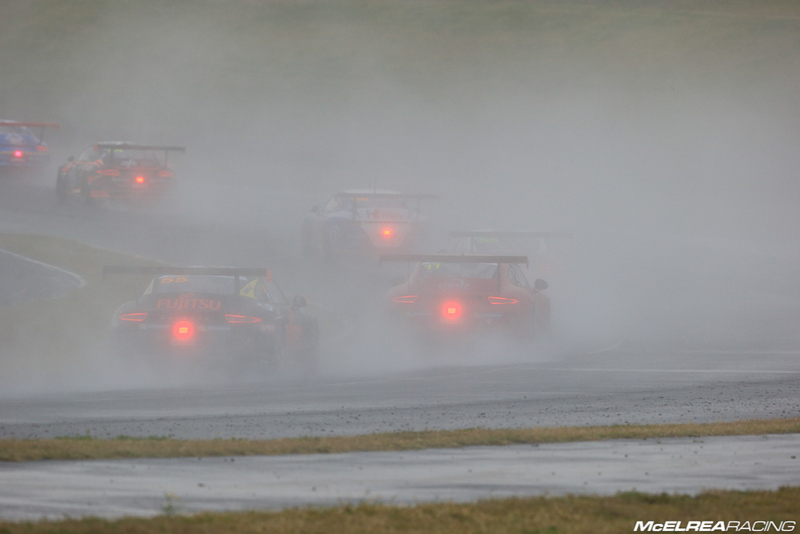 Tony finished 15th outright and 5th in Elite in the very challenging and wet opening race. He had a tough race 2 finishing 11th in Elite but he bounced back in fine style in Race 3 to finish 15th outright and 7th in Elite, but most notably he had the best Elite Class lap time and was over 3 tenths quicker than Elite race winner Smollen. Another podium finish for Wallsy must be in the very near future..!! 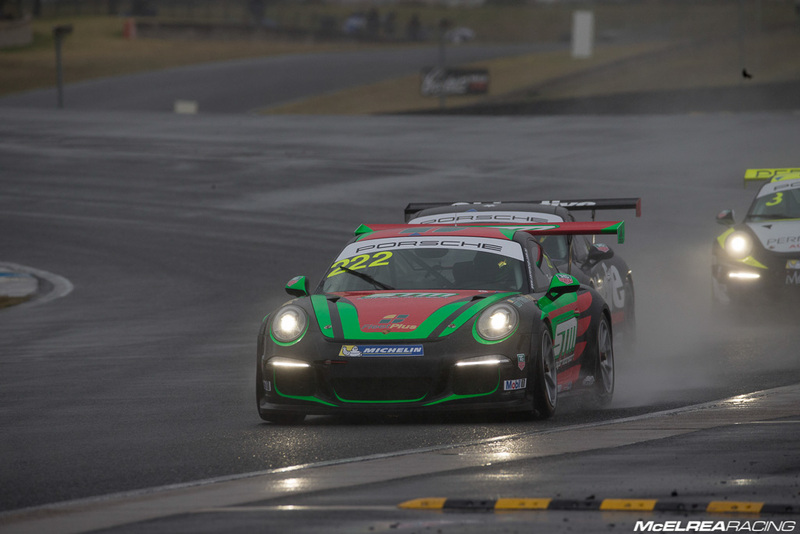 It is without question that Scott had one of the most impressive Carrera Cup Elite class debut’s on the weekend at SMP. 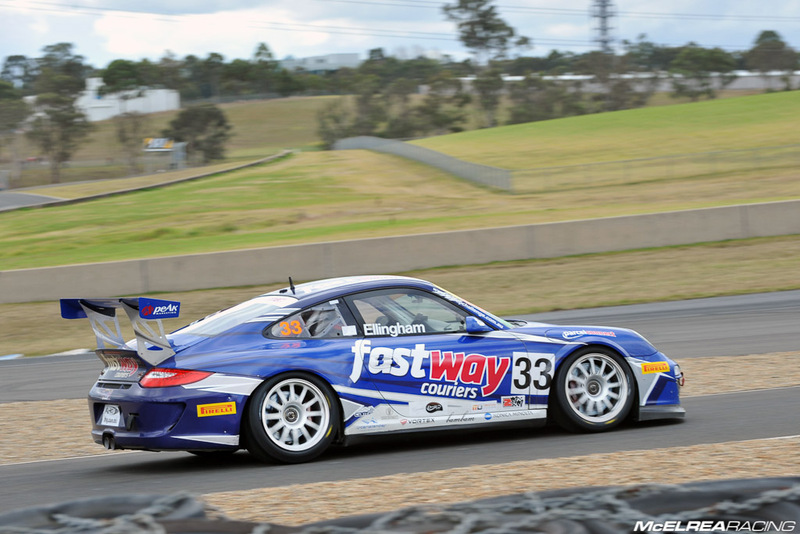 Scotty has been racing with MR in the GT3 Cup Challenge since the beginning of the 2013 Championship after doing a few ‘Aussie Race Car’ events. 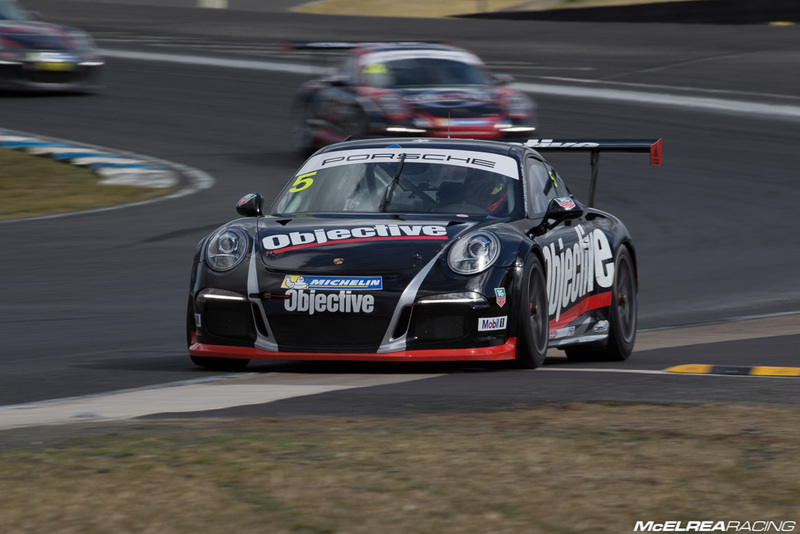 Scotty qualified 11th in Elite ahead of 2 Carrera Cup regulars and another Carrera Cup débutante Greg Taylor. He did a very solid job in races 1 and 2 to gain valuable experience in the much more competitive category. Incredibly, he was heading for 14th outright and 6th in Elite in Sunday’s race 3 when the road ‘jumped out from underneath him’ resulting in a 17th outright and 9th in Elite. Scott Taylor adapted well to the wet conditions in his new Cup Car..!! ‘Hoves’ tweaked his ribs in a skiing accident a few weeks ago so he called on the services of Phillip Island 101 team mate Matt Campbell to share the load at Eastern Creek. As a result, they qualified 14th outright and 5th in Trophy Class against some far more exotic machinery. Matt started race 1 and did an outstanding stint to keep the car straight and hand over to Hoves. Due to a full course safety car period and some quick thinking by the MR crew Hoves was placed 3rd outright and first in class when the safety car pulled in with some 20 minutes remaining. Unfortunately, due to another driver having a moment and a few other cars locking-up, Hoves had no option but tag the back of another car breaking his radiator forcing a very unfair DNF. Race 2 was far more representative of Michael and Matt’s pace with the Triffid car finishing an amazing 11th outright and 3rd in Trophy class. Second in Trophy class for the weekend would have been on the cards, had it not for the bottleneck incident on Saturday. Hovey once again drove superbly but unfortunately a DNF in the opening race dashed a certain podium finish. ‘Si’ recently ran in the GT3 Cup Challenge at Qld Raceway which gave him a taste of sprint racing, which is all new to him. 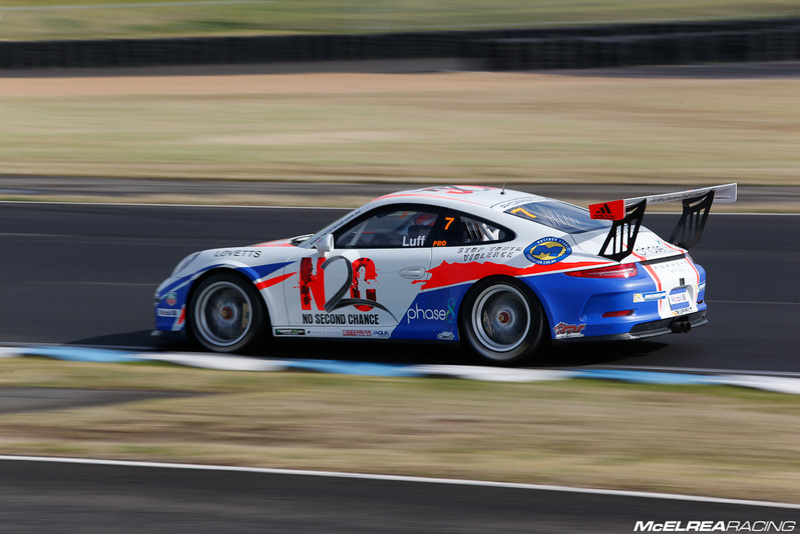 Amongst a field of supercars he qualified his Porsche GT3 23rd outright and 10th in Trophy Class. Simon did a good job in Saturdays race finishing 19th outright and 8th in trophy class. We had very high expectations for him in Sundays’ race and were hoping for a slightly quicker race pace, but to his credit Simon followed the very clear instruction from his MR Engineer to finish the race rather than take any unnecessary risks (as consistency is what gains experience and ultimately wins Championships). He finished a very solid 18th outright and 7th in Trophy class. It is a fun working with young drivers like Simon and watching them mature as and improve racing drivers. Simon will do a final test at our home track Queensland Raceway next week before rolling out again at Sandown for the next round of the AGT Championship. 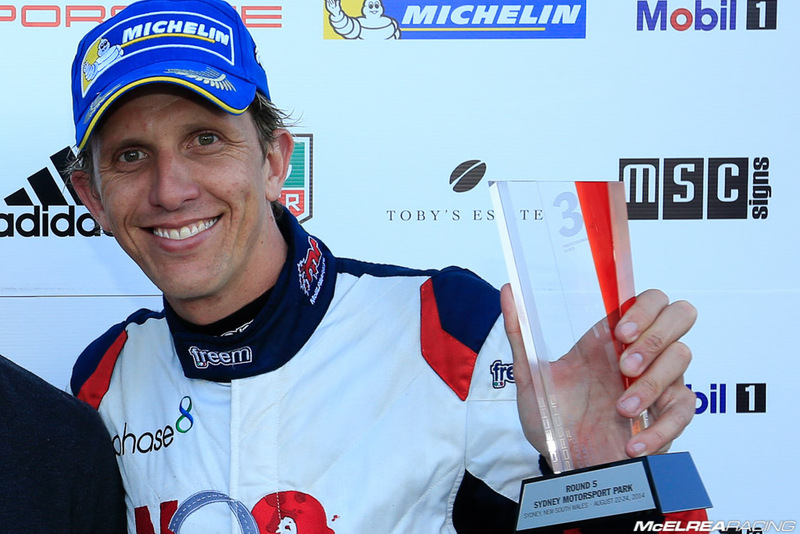 Simon Ellingham continued his great progress in his first AGT race weekend without a Co-Driver. 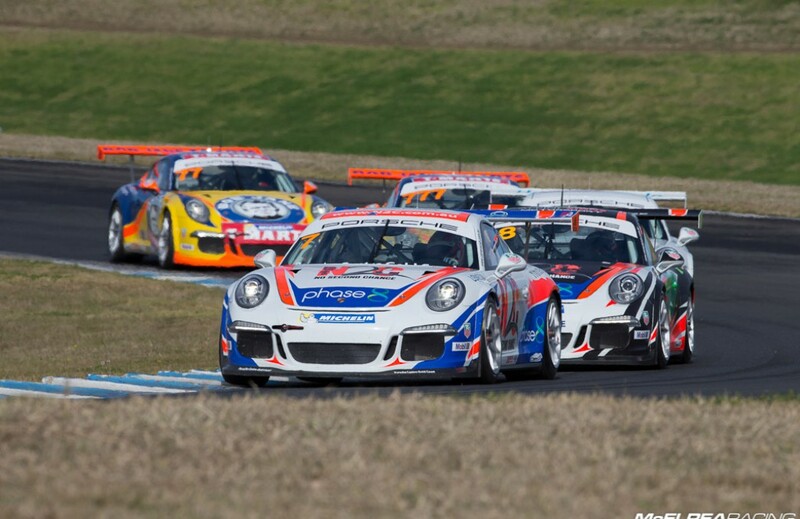 We are really looking forward to getting back on track at the next round at Sandown Raceway in 3 weeks as both Carrera Cup Elite drivers Tony Walls and Scott Taylor raced there in GT3 Cup Challenge earlier in the year, so we are confident this will translate to early pace for both these guys. Renee also did some laps there at a ride day a few months back and Shae and Luffy are both motivated to push forward in the Championship. Matt Campbell is likely to join Hoves at Sandown, so they are on target to embarrass some heavy hitters and Simon will no doubt take another step forward in his development. The whole MR team are determined to get all of our drivers further up the grid, so watch this space..!! Thanks to all of our partners and supporters for keeping in touch and following us on our journey so far in the 2014 Carrera Cup and Australian GT Championships..! !